Readers of my blog will remember that I had to import a potato peeler from the UK (courtesy of friend Olaf who was passing through my corner of Germany on his bike). This is because the German potato peelers just don’t work for me. My landlady Gudula didn’t believe my peeler was as good as hers and in the end we decided we needed to have a competition to see whose peeler was best. Gudula’s daughter Lara also wanted to be involved as she uses a third type of peeler, a Spargelschäler (asparagus peeler) which is a different shape. After a brief test-run a couple of weeks before on some windfall apples it became clear to me that I was definitely not as quick with the peeling as Gudula and Lara. Consequently I thought we needed to widen the scope of the test – not just for speed of peeling but also for how much potato flesh came off with the peel (i.e. how much food was wasted), as well as the visual end result of the peeling. 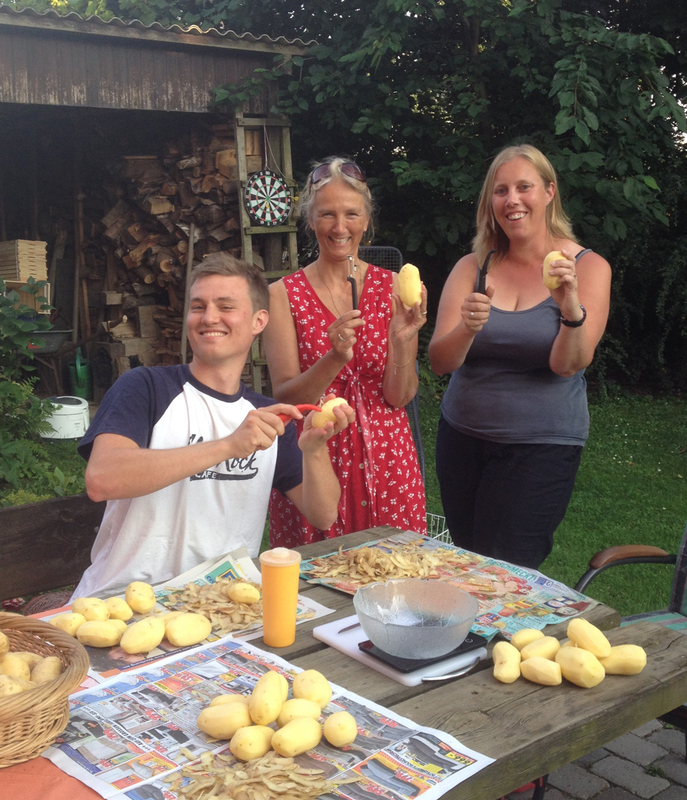 Because we would end up with vast quantities of peeled potatoes Gudula thought it wise to invite some hungry young men round so Nils (eldest son) who was here for the week invited four friends to come over for Pommes (chips): Philipp, Christian, Sebastian and Uli. The only suitable date was today, 22 July, which unfortunately meant that Lara couldn’t take part as she had to work. We will probably be having a second attempt later with her so she can attempt to prove the superiority of her peeler. 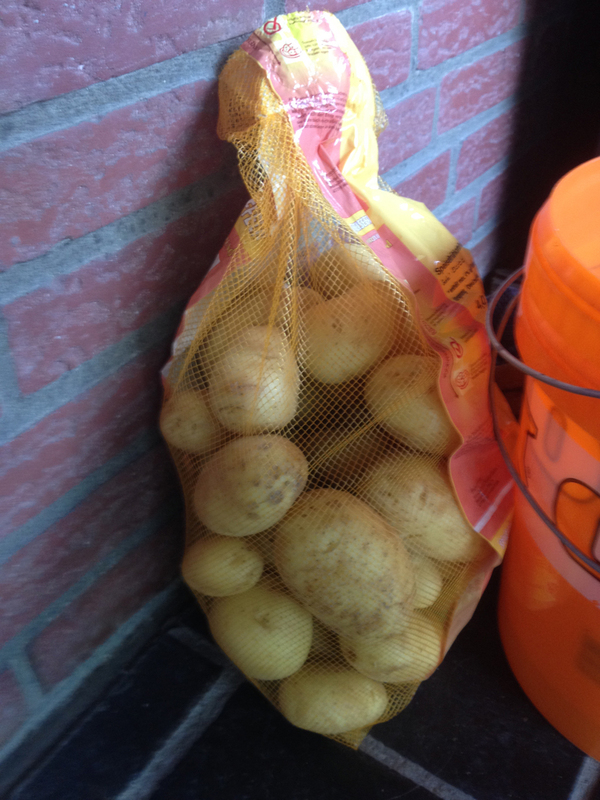 Gudula bought two 4kg sacks of potatoes, plus she already had half a sack at home. 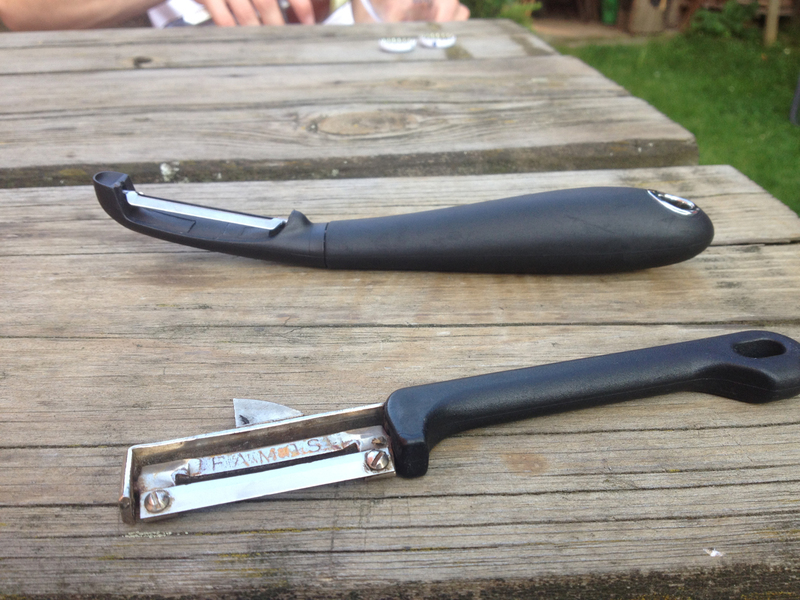 The main tools for this challenge were the two peelers – the very posh John Lewis’s one bought three months ago (at the back of the shot) and Gudula’s twenty year old faithful peeler (at the front). 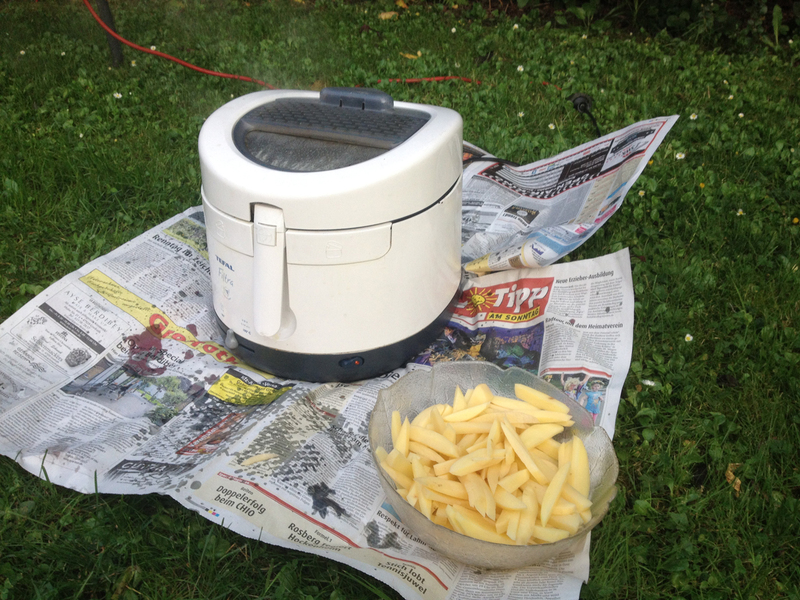 We arranged our seating outside and had our basket of potatoes. 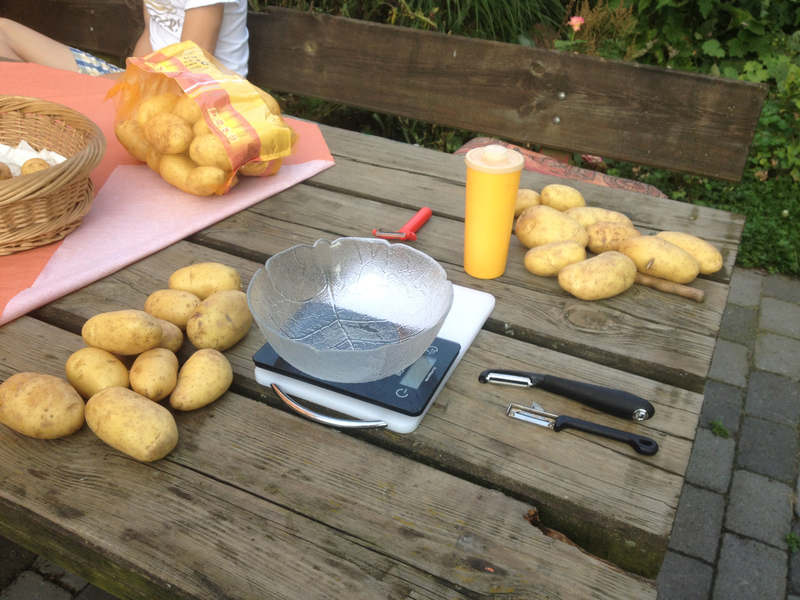 I realised that it needed to be organised somewhat for a fair competition so we got some weighing scales and I weighed out 1.5kg of potatoes each. The idea was to weigh the potatoes after they were peeled to see how much was wasted in the peeling process, as well as timing the actual peeling. The number of potatoes wasn’t quite the same (my pile had 10, Gudula’s 9) but they were almost exactly the same weight. 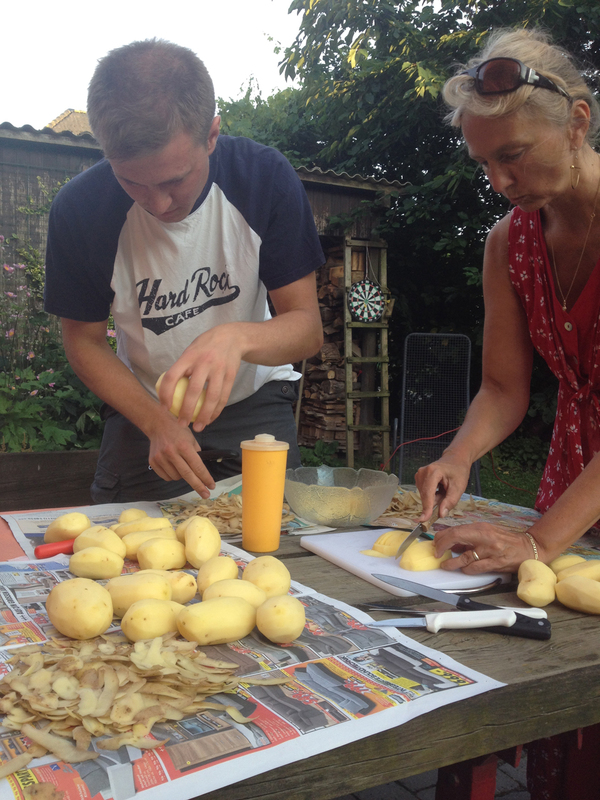 As Lara wasn’t here, but her peeler was, we co-opted Philipp to peel for the younger generation and weighed him out 1.5kg of potatoes too. He had 11 potatoes (the ones left were a bit smaller). Nils was ready with his stopwatch, we had our three piles of potatoes, newspaper for the peeling and of course our preferred potato peelers and off we went! As you can see from the video, Gudula finished first, at three minutes sixteen seconds. Philipp was second at 3 minutes 57 seconds and I was just three seconds later at exactly four minutes. Here we are looking very proud of our peelers! We then proceeded to weigh the potatoes (minus their skins) and found the following. 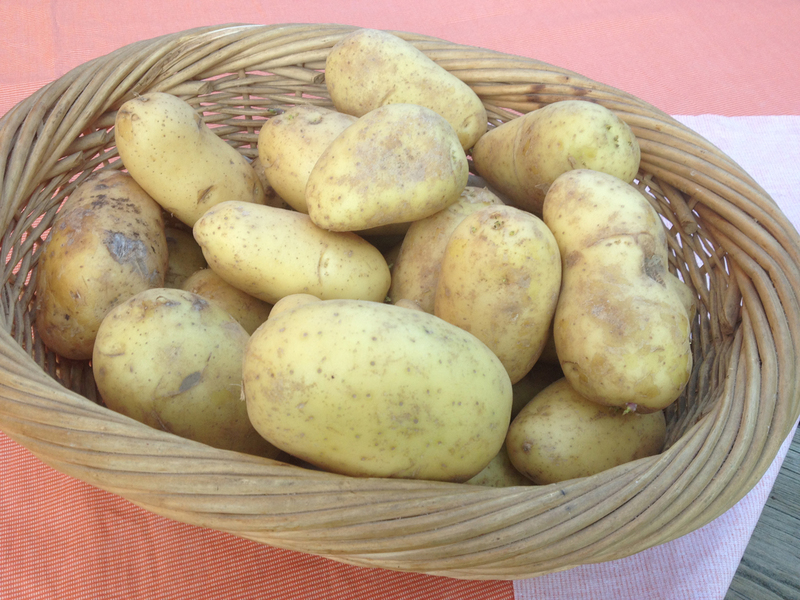 Frank, Sebastian, Christian and Uli agreed that my potatoes and Gudula’s were of a similar peeled quality but that Philipp’s were rather rougher. So the conclusion was that if you want speed you use Gudula’s peeler, if you want good value from your potatoes you use mine. It was then time to slice up the peeled potatoes to make chips. And came out in due course looking and tasting very good indeed! 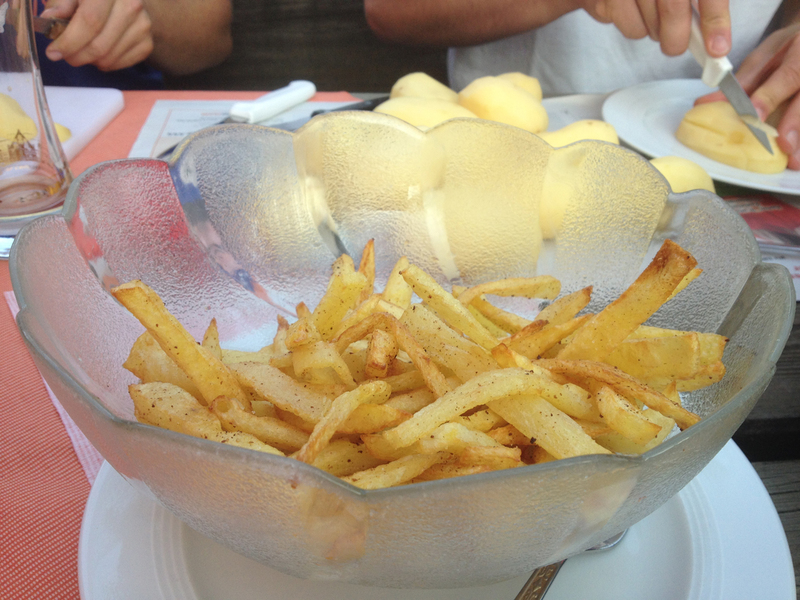 The fryer took a while so we had several courses of chips with gaps in between. We also had some Frikadellen which Gudula had cooked. 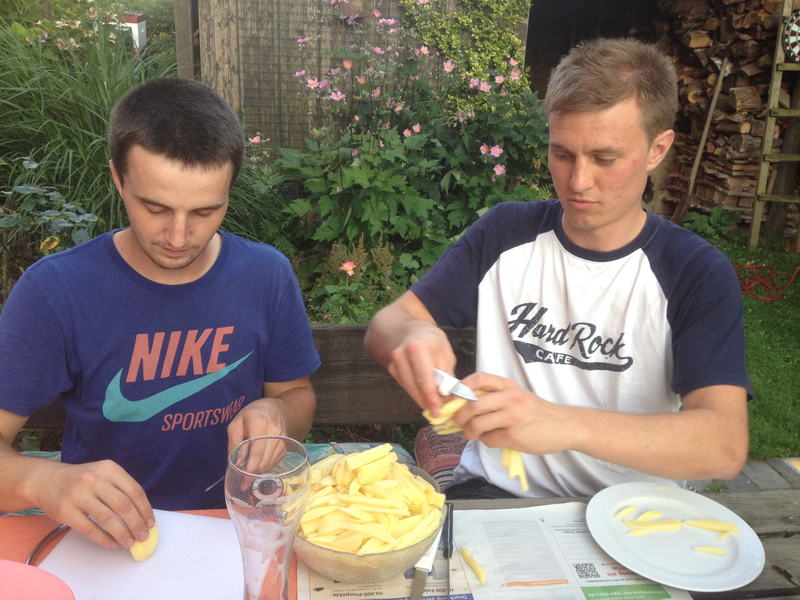 We realised that our 4kg of peeled potatoes were not enough so the lads set to work to peel some more. I sipped my drink and basked in the glory of being the least-wasteful peeler of potatoes in the locality whilst the lads worked hard at continuous potato peeling and slicing. Of course to go with the chips we needed sauces. 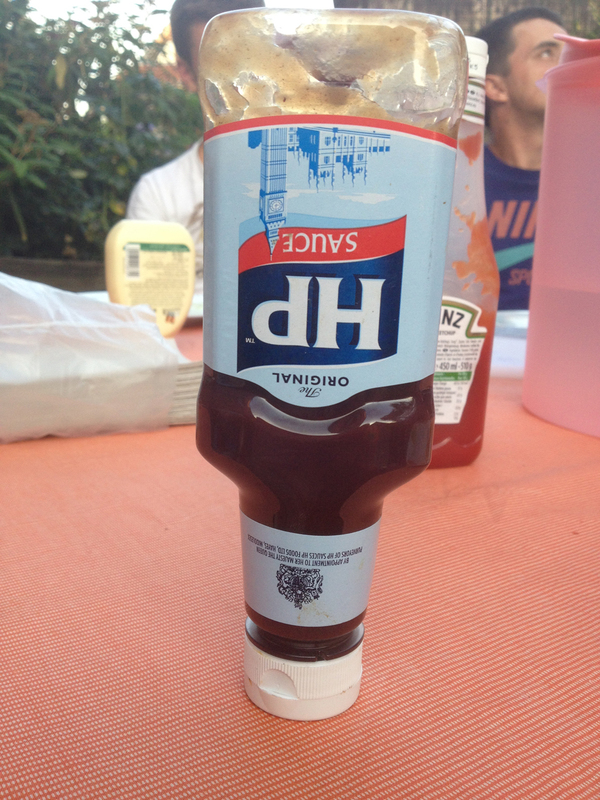 The obligatory Mayo was on the table but I fetched my Heinz Tomato Ketchup and Lara’s HP Sauce (that I had brought her from England) also made an appearance. 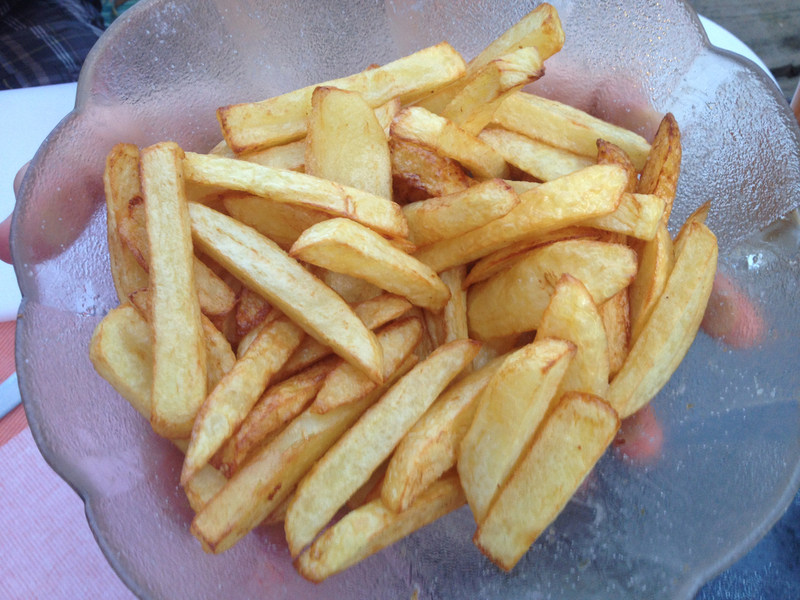 I suggested they tried slicing them into chunky British chips which they did – sehr lecker! Although Nils didn’t believe my comment that chunky chips are less fattening than french fries (due to a smaller surface area to volume ratio). Uli tried to convince him by comparing different breeds of penguins but he seemed unconvinced. We ended up peeling and slicing probably 9kg of potatoes for the nine of us there. Rather a frightening thought! Frank also fetched Lara’s Marmite (she’s gone a bit native as a Brit, having spent six months there a few years back, and has developed a taste for our food which few Germans have!). Various people around the table tried it – not me, I know I hate it. Anyway, Uli tried some and his eyes went out on stalks and he looked rather discombobulated by it all. He wiped the remaining Marmite off his plate to avoid accidentally having any more. Lara arrived back from work to find us all sitting round the table stuffed full of chips (and the lads of beer as well). I am sure she is convinced that she would have made a better showing of the competition with the Spargelschäler so I think another competition may be in the offing. However, it was noticeable that when further potatoes had to be peeled, the lads all used my peeler as their preferred option. The fact that you had 10 potatoes to Gudala’s 9 implies that you had almost 10% more surface area to be peeled. That would account for you being slower, but you did especially well to waste as little as you did. The calculation about the surface isn’t quite right, though, because in order to have the same weight those 10 potatoes had to be smaller. Given spherical objects with constant density one would be able to calculate the exact difference but going that far would spoil the fun, I reckon. Poor Uli! What a shock to his taste buds. 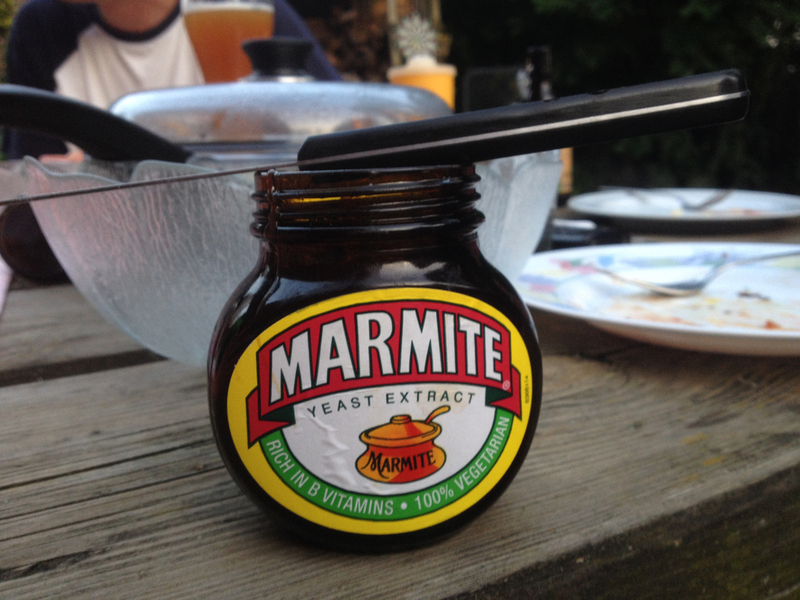 The English are divided down the middle as far as loving or loathing Marmite! In this household, Pete loves it, I loathe it.